Is Xmas Shoppping Starting Too Early? On your mark…get set …go shopping! With Black Friday, small store Saturday and Cyber Monday, the race for Christmas shopping has officially begun. Black Friday seems to inch earlier and earlier each passing year. Hoping to real in more shoppers some big box stores like Walmart, K mart Best Buy and Target opened their doors for Black Friday deals on Thursday evening requiring their employees to cut their Thanksgiving short. Despite the crowds, there are many complaints that Christmas sales are starting too early. If you think its holiday shopping frenzy seems to come earlier and earlier every year you would be wrong. 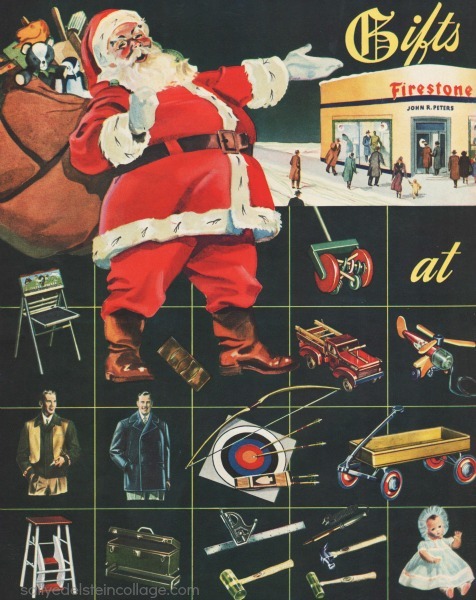 During WWII, Xmas ads for Firestone Service Centers, started running as early as Nov 3. 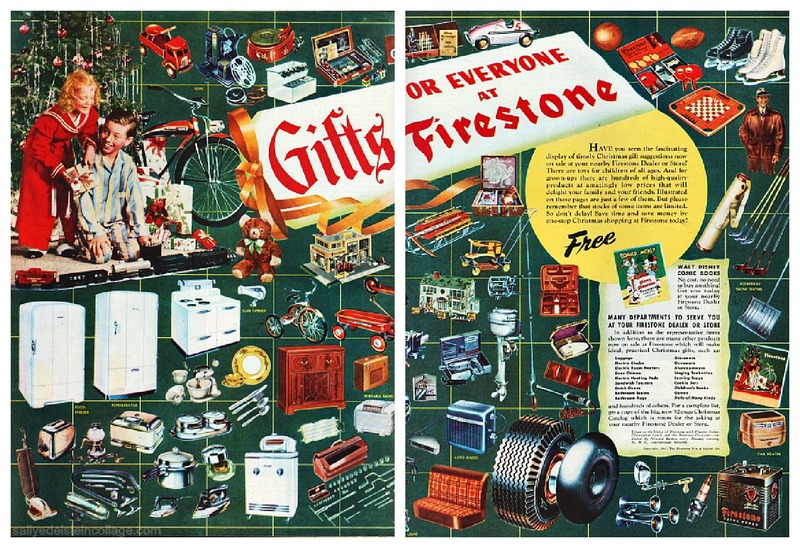 In a time of small Mom and Pop shops Firestone Centers were your one stop shopping for all your household needs from auto to kitchen to clothing. Though things were rationed and in short supply you could still go Christmas shopping and save your hard earned war work money choosing useful gifts that would help everyone to conserve and save. Firestone Tire and Rubber Company was founded by Harvey Firestone in 1900 to supply tires for buggies and wagons. Paling up with Henry Ford he supplied Ford Motor Co with tires. 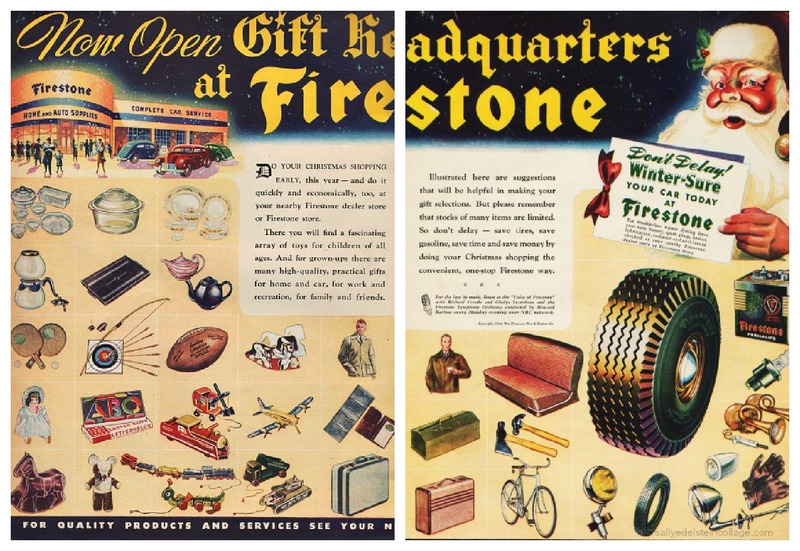 It wasn’t long before that great producer of tires joined the retail store business offering basic car services and tires sales in the mid 1920s when the original Firestone Service Centers were opened. “Toyland is open today at your nearby Firestone Dealer and Firestone store. 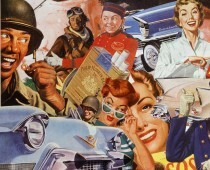 And what an exciting array of toys for children of all ages- trains and planes, dolls and games, paint sets and musical instruments, kiddie cars and ice skates.”stated this jolly war time ad from 1942. Post War Xmas shopping ads remained running in early November. 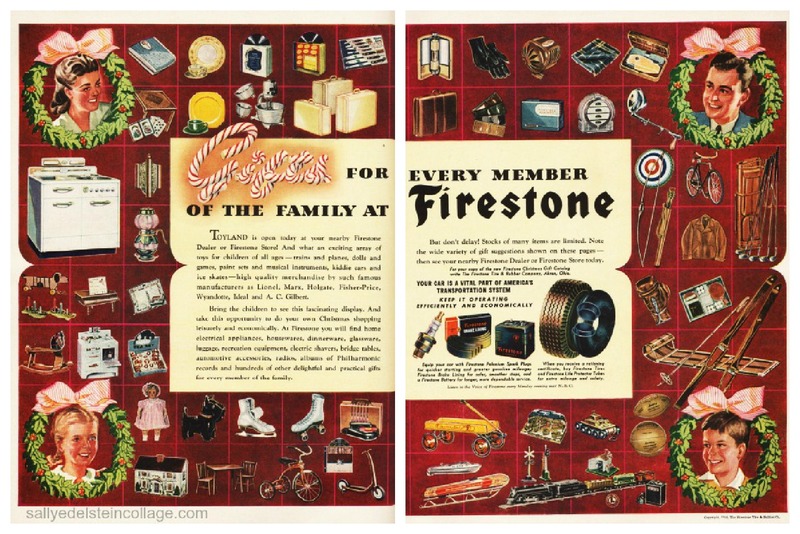 At Firestone you could get anything for your Post war home from luggage to electric clocks. door chimes, and sandwich toasters, bathroom scales, singing tea kettles, cookie jars , ovenware and so much more. Is it really too early to be thinking about Christmas shopping in November?